Authority of the Slovak Paradise National Park has allowed regulated kayaking at the Hornad canyon since 1st of May 2016, as a response to big interest in this activity. Whereas given activity cause for the nature of Slovak Paradise certain burden and environmental risks, given activity is limited and performed under constant control of National park authority. Kayaking in Hornad canyon in National Park Slovak Paradise is allowed from 1st of May to 31st of October. Kayaking is allowed only for single or double seat boats – kayaks, canoes and inflatable boats. Multi- seated boats, rafts and other vehicles are FORBIDDEN! !!! It is necessary to have own boats, Slovak Paradise National Park does not provide them!!! Person interested in kayaking send filled form. After correct completion and despatch of the form, the registration will be confirmed in the dialog box of the form. Please, complete the registration for kayaking at least one day (until 04:00 pm) before required day of the kayaking. Therefore, system can register your application and worker is able to issue a permit for kayaking. You can check the occupancy of the booked days in the year by the number of boats in Calendar of registered vessels for kayaking in Hornad canyon. To the registered participants we recommend to check the water level development of Hornad river before scheduled term of kayaking. In case of higher or lower range of water level as permitted, the kayaking will not be possible to accomplish! 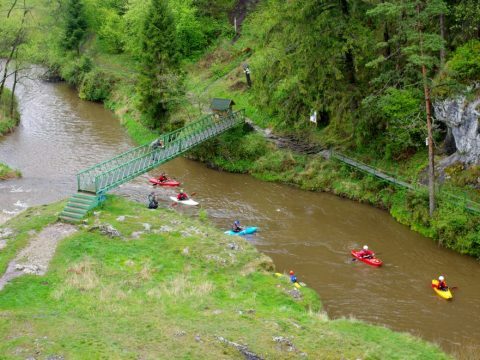 Based on the fulfilling the conditions, authority of the Slovak Paradise National park issue a permit (ticket) for kayaking at the starting point at the locality Hrabušice,Mýto – most, according to the date and time indicated in your registration. Kayaking will be possible also without pre-registration right on the given place, however issuing a ticket for kayaking due to overcapacity (70 boats per day) is not guaranteed. Employee of the Slovak Paradise National park will be present at the locality Hrabušice,Mýto – most during the weekends and public holidays from 1st of May to 31st of October at the time from 8:00 am – 9:00 am , 10:00 am -11:00 am and from 13:00 pm – 14:00 pm., when he issues a permit. During the working days can interested person without pre-registration contact employee of the Slovak Paradise National Park Mr. Róbert Javorský on the phone number +421 903 298 223. In case of unavailability and from 1st of July 2018 please call +421 903 298 214. Kayaking in Hornad canyon is charged. Fee for one person for disposable kayaking is 10 euros. Insurance for intervention of Mountain Rescue Services is included in the price. 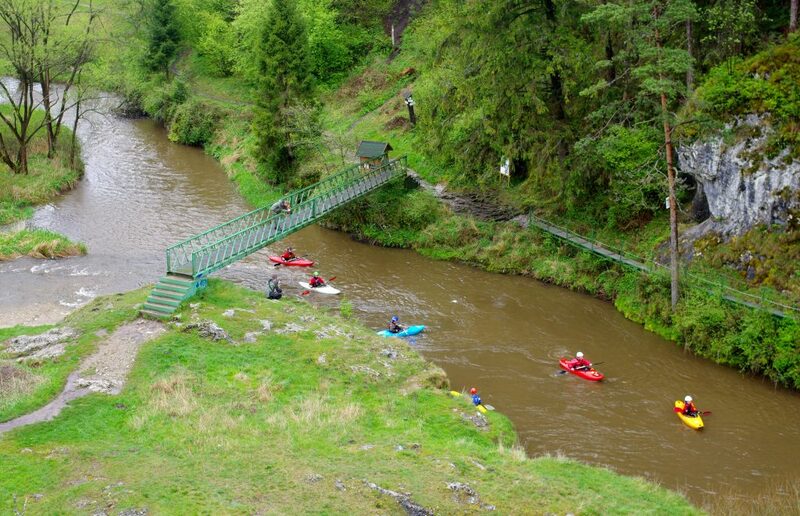 Payment for kayaking permission shall be made in cash right at the starting point Hrabušice,Mýto – most during recieving of the permit. Parking of motor vehicles is possible at the starting point (Hrabušice,Mýto – most ) in limited capacity! WARNING: The area is under video surveillance! In case of illegal kayaking in Hornad canyon (without valid permit or in case of failure to comply with the conditions listed in the operating instructions) shall be imposed a fine up to 66 euros by employees of the Authority of Slovak Paradise National Park or nature guards. We wish you a lot of beautiful moments while exploring the Slovak Paradise from your boat! Spring of river Hornád is on the north-east edge of Low Tatras and after more than 30 km it comes to the edge of Slovak Paradise near Hrabušice. After the short meandering part it leaves Hornad basin and enters to its most beautiful part- Hornad canyon. Hornád takes its way through the deep limestone canyon with the high steep walls and creates a part, which is unique place in Slovakia but also within Central Europe. State Nature Conservancy of the Slovak Republic, Authority of the Slovak Paradise National Park, Štefánikovo námestie 9, 052 01 Spišská Nová ves, is the authority managing Slovak Paradise National Park, which was proclaimed by Government Order SSR No. 23/1988 Coll. about the Slovak Paradise National Park dated 18 January 1988 (hereinafter referred to as the “Authority”). By these operating instructions, the Authority stipulates conditions for using of the Upper River section of the Hornád River called “Prielom Hornádu” in order to its kayaking within the limits of rights and obligations arising from Act No. 543/2002 Coll. on Nature and Landscape Protection and Related Legal Regulations. Route of the kayaking: River Hornád in section from Hrabušické Mýto – Hrdlo Hornádu – Letanovský Mlyn – Čingov (hereinafter referred to as the Hornád). Kayaking in Hornad canyon in National Park Slovak Paradise is allowed from 1st of May to 31st of October, as long as the Authority does not forbid it in writing for a special reason. Hornad canyon can be passed by boat in the interval from one hour after sunrise to one hour before sunset. Number of boats is limited to 70 per day. Kayaking is allowed only for single or double seated boats. The Authority is entitled to restrict the kayaking for a special reason in a given day and not to allow kayaking. The Authority is entitled not to allow kayaking due to overcapacity (70 boats) in a given day. Kayaking on the Hornad rived is allowed to those, whose physical abilities and knowledge enable to pass in accordance with the operating instructions stipulated by the Authority herein. Water level of Hornad river on water level meter in Hrabušice must be in the range 70 cm – 110 cm in the day of kayaking . Informations about water level on SHMÚ website at 8:00 am in a given day are crucial. In case of sigificant change of a water level during a given day is Authority entitled to restrict the kayaking. b) kayak only with valid single- pass permit (ticket) issued by the Authority, and identify yourself with an identification card and ticked when asked to do so by an employee of the Authority of Slovak Paradise National Park or by a nature guard. c) kayak only after become familiar with at least fundamental safety principles and techniques, and with suitable kayaking equipment (kayak, canoe, paddles, life jacket, helmet, security equipment against the sinking of the ship (pouch, floating barrel, ball); the Authority does not provide any training for kayaking and any equipment neither. Participants shall obtain their own equipment to their own expenses and discretion. d) follow the rules of public policy and shall not impinge on others legitimate interests by inappropriate behavior and disturb the environment around by being inappropriately loud. e) treat the nature with respect mainly by keeping place tidy and clean, follow hygiene regulations and do not perform any activities, which result in water pollution, especially do not throw garbage into the water. f) follow the instructions given by the Authority of Slovak Paradise National Park employees and nature guards and inform about any breach of the operating instructions that the visitor becomes aware of. a) Kayak under influence of alcohol, narcotic and psychotropic substances or in health conditions having a negative impact to consciousness, balance, eyesight or other sensory receptors, or in conditions, which prevent from safe passing of Hornad canyon by boat. It is also prohibited to use such a substances while kayaking. Participant perform this activity on his own responsibility and risk. The Authority shall not be held responsible for any potential threat and/or damage to life and/or health of the participants. For the safety and actions of participants under 18 years of age their legal representatives are responsible, regardless of whether they are present during the kayaking. The Authority shall not be held responsible for any loss of participant´s belongings during the kayaking. The Authority provides only insurance for intervention of Mountain Rescue Service, while fee for insurance is included in the price for one single – pass ticket issued by the Authority to the participant. Starting signed point of kayaking is Hrabušice – Mýto in a village Hrabušice near the bridge on the left side of Hornad river. Exit signed point is Čingov near Chata Ihla on the right shore of Hornad river. Kayaking is possible to interrupt on a signed spots Hrdlo Hornádu and Letanovský Mlyn if necessary. Access with a motor vehicle to this places is possible only in emergency situation and in case of healthy risk or significant damage to belongings. The Authority is entitled throught the employees of Slovak Paradise National Park and nature guards refuse the permit for kayaking to the boats, which breached the provisions of this operating instructions and ask all the members of crew to leave the Hornád. Participants are obligated to accept the alert and quit the kayaking immediately. These operating instructions are valid from 1st of May 2016. The Authority is entitled to amend these operating instructions. In case of modification of conditions, the operating instructions on the notice boards in Hrabušice-Mýto and Čingov and on website of the Authority of Slovak Paradise National Park www.npslovenskyraj.sk are determining. Under the name “participant” is understood the person, who passes the Hornad river even without valid single- pass ticket issued by the Authority for the purposes hereof. Attached map is a part of operating instructions.